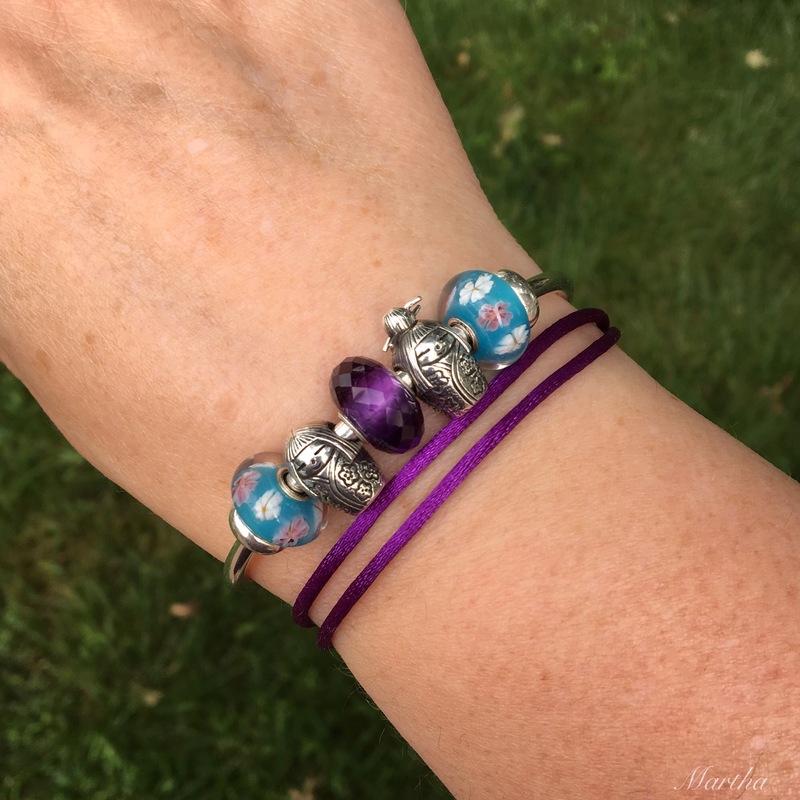 Today is a short blog post to show the sweet little Kokeshi 2.0 from Spiritbeads at Star Bijou. The first Kokeshi doll has the hole going through her vertically, but the 2.0 hole goes through her horizontally. The bead costs €45. There is also the Limited Edition version with the cute hairdo, but I believe that sold out just a couple of days ago. Here is a video of the 2.0 version. The three Kokeshis gathered together for a little meeting. I love the smile on their faces! 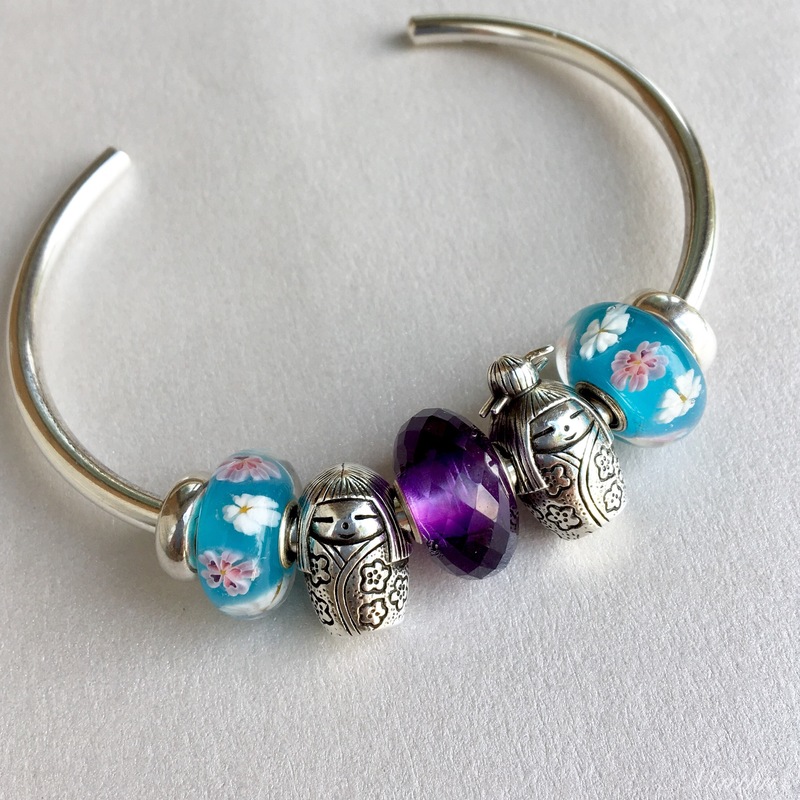 I used the Trollbeads Blooming Sakura beads with the ladies and added in the Pandora Purple Friendship Bracelet. 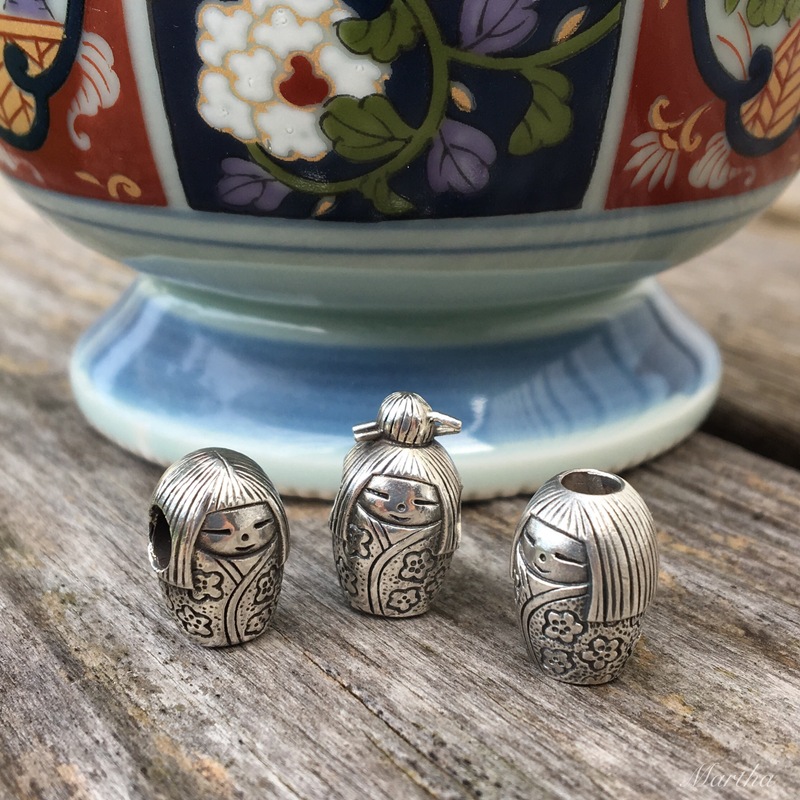 The Trollbeads Kimono Kit is always what I think of with the Kokeshi and Daruma, too. 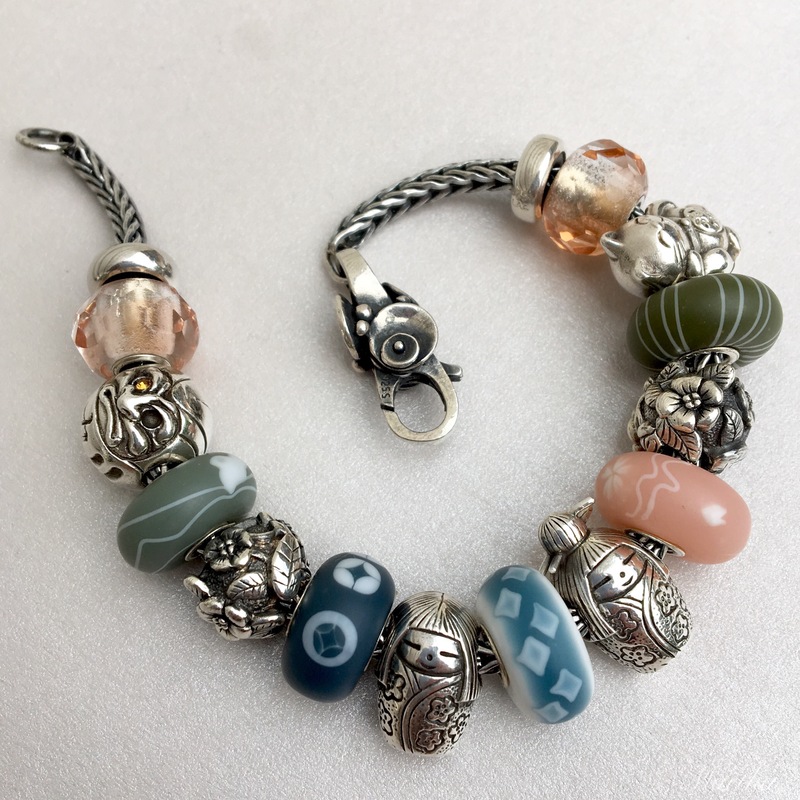 On the ends are Trollbeads Pink Prisms and I’ve added in the Silver Sakuras and Maneki-Neko, also from Spiritbeads. The original Kokeshi fits perfectly on a necklace, in this case one by Spiritbeads. If you hit the Spiritbeads tag on the bottom of my blog there are articles on all of these! When I get back to work in the fall this would be a really fun combo to wear. I absolutely adore these sweet beads. Nicolai at Star Bijou really has a knack for making beads with the sweetest faces. The Lucky Monk and Kokeshi beads convey such a feeling of happiness, even though they are little metal objects. Were you one of the people who purchased the Limited Edition Kokeshi or is the 2.0 version on your radar? Hi Martha, I am such a fan of Asian inspired beads! I just adore the Kokeshi beads and the Lucky Monk. I especially like your bangle with the Blooming Sakura beads. I was lucky enough to finally get one of those and have also managed to get four of the Kimono Kit beads. The one that continues to allude me is Ageless Beauty…my own fault because I didn’t get it when I could have. Hi Suzanne! I also love the Asian inspired beads. They are feel so refined and elegant to me. I’m so happy you’ve managed to find 4 of the Kimono Beads! I shall keep my eyes for an Ageless Beauty, but that would definitely be hard to find, I think. Agree “refined and elegant” are great words to describe so many of the Asian themed beads! Love them and these adorable Kokeshi (I lucked out finding a Kimono kit from Star Bijou earlier in the spring and am smitten with the gentle patterns). 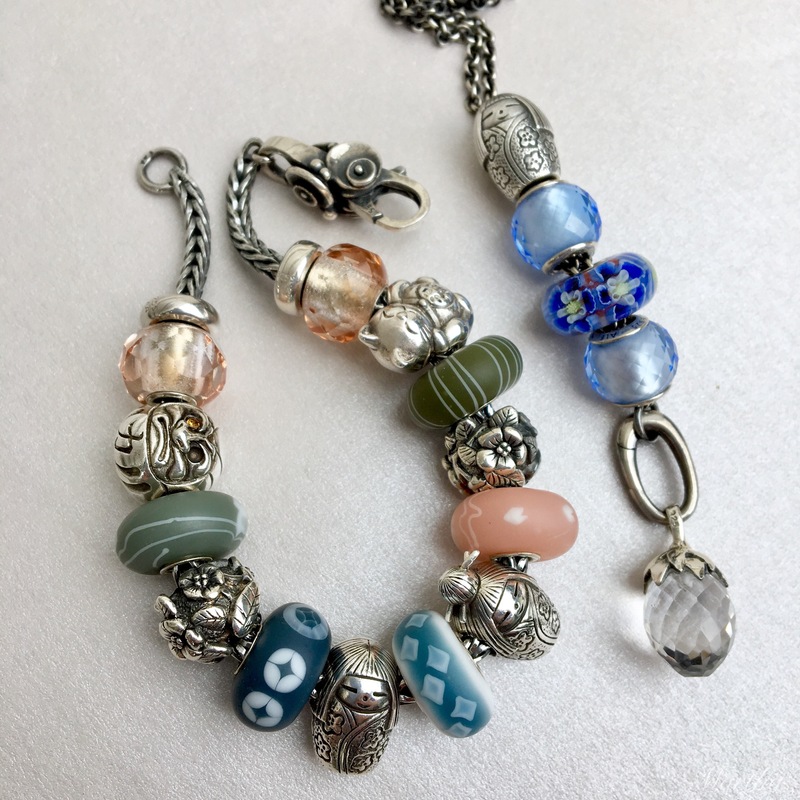 I have been very impressed lately with the Spirit Beads line, I think alongside Redbalifrog they are making some of the most interesting silvers lately! There are those lovely pink prisms – they are the perfect beads for that kokeshi combination! And I love what you did with the two blue Pandora petite facets! Really pretty ways to set off this cute kokeshi doll. What a shame the topknot version is sold out. Oh yes and I feel bad showing it just days after it sold out! I’m glad you liked the Pandora Petite Facets on the necklace as I really waffled about doing that. I love the Petite Facets and Trollbeads’ Prisms too. With the shape and size I find they look lovely at the ends of a bracelet and add some interest, too. The Petite Facets look incredible with the Spiritbeads dragon parts! I’ll put up pictures on Thursday. Hi Martha, is there any difference in the silver finish of the original Kokeshi versus the 2.0? In photos on Star Bijou’s website it seems the 2.0 bead is shinier. Thanks! Hi Andrea, I’m afraid I’m away camping so can’t take a look, but I’m pretty sure they are the same. Definitely send them an email as they speak English and would be happy to let you know for sure.